The National Park Service and Secret Service plan to install temporary half-inch steel spikes atop the White House fence in an effort to reduce breaches of the White House security perimeter. National Park Service documents describe the spikes as "pencil points" which will attach to the existing fence and serve as a "removable anti-climb" mechanism. The spikes - an interim measure - will be bolted on to the fence at a 5-degree angle. Installation was approved Thursday by the U.S. Commission on Fine Arts. In a statement, the National Parks Service said, "The interim solution enhances security without affecting the visitor's experience. A timeline for installation is not yet available, but we are working expeditiously on this improvement." Last September, 42-year old Omar Gonzalez scaled the north lawn fence and ran into the executive mansion before being apprehended near the Green Room. The proposal still needs the endorsement of the National Capital Planning Commission which meets May 7th. Construction would begin thereafter, if it's approved. 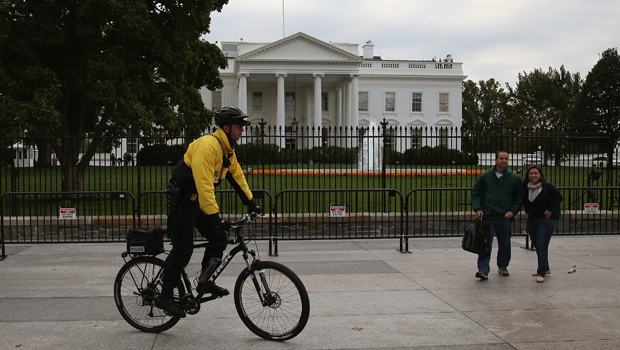 Permanent security renovations to the White House complex, Eisenhower Executive Office Building and President's Park are also being considered. The federal government has hired Rogers Partners Architects to overhaul pedestrian areas, vehicular access points and the fence. Rob Rogers, the lead architect of the project, called the makeshift barriers, construction barrels and bike racks that surround the complex currently a "collection and stack-up of temporary measures." The permanent re-design will have to meet "climb delay and blast resistance" requirements, according to Tobin Tracey of the National Park Service, who, along with Rogers, presented an broad overview of the preliminary proposal before the US Commission on Fine Arts, but few specifics. If approved later this fall, construction could begin as early as summer of 2016.